A lot of people donâ€™t like Butterfingers (I am kinda in the middle myself), but even if you donâ€™t, itâ€™s a candy bar you should appreciate for its uniqueness. Sure, itâ€™s not as good as a 5th Avenue (before they started using mockolate), but it actually predates the Hershey version by thirteen years to be the oldest, most popular peanut butter candy bar on the market. Over the years, one spin off I often saw was the Butterfinger Giant tempting me from numerous candy aisles; however, I never bothered to buy one. I was actually a little confused by them, to be honest. The packing is similar to the Ã¼ber-large Crunch bars Nestle also produces. 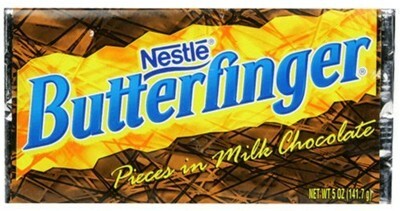 Since the wrapper reads “Butterfinger pieces in milk chocolate,” I was always left speculating if this was a flattened and large Butterfinger bar, like how Crunch bars are all the same taste, just varying in size, or was this a Nestle milk chocolate bar with Butterfinger pieces loaded inside? Finally giving into the temptation because of a sale at Walgreens, I purchased one of these to find out the truth behind the Butterfinger Giant. Opening the foil, the bar exudes faint traces of peanut butter. Examining it, my hunches are confirmed; this is indeed a Nestle chocolate bar with Butterfinger pieces. The break is firm, but not hard, with an easy snap. Upon first bite, I am transported to the realm of Butterfinger goodness, but waitâ€¦ something is different here. That crunchy layer of peanut butter that gets stuck in your teeth is missing, but it still tastes like a regular Butterfinger! I am amazed by how much I am enjoying that taste and sensation. That is until I begin to get a sense of the chocolate. The chocolate is mild and a bit waxy, almost flavorless compared to the boldness of the Butterfinger pieces, much like the original bar where the mockolate coating is more ornate than tasty. Its mundane quality really brings down the greatness of the other flavors manifesting in the bar. Compared to the original, this baby has some nice advantages. One, itâ€™s actually set in real chocolate: the problem with this is that Nestleâ€™s chocolate isnâ€™t all that appetizing to me. The second good thing about the bar is that because the Butterfinger only exists in pieces, it doesnâ€™t overwhelm your palate. I also enjoyed how I didnâ€™t lose any fillings with pieces getting stuck in my teeth. I still think that the Butterfinger Crisp is the most superior of all Butterfinger products, but this is a lovely addition to the line. Had the chocolate been richer, say like an amazing Ghirardelli dark chocolate, this would be an awesomely addictive candy bar hands down. If any Nestle people are reading this, feel free to use my idea (just as long as I get a case of them as compensation). yummmmmmm yummmm yumm!!!!! I love Butterfingers and I love chocolate for my treat once and a while and now that they nade it all together!! OHHH!!!!!! Dammit I love BUTTERFINGER! When I eat on McDonalds and order Mcflurry usually I want butterfinger in it instead of oreo. Yummy! I’m not a big fan of the Butterfinger. However I LOVE Butterfinger Crisp!! This Butterfinger Giant sounds a little more edible than the original. I may give it a try!